When I saw the title for Sue's Rednesday I knew that this was the perfect time to show off my little red bird. I found it in an antique shop several years ago and instantly fell in love with it. It just looked so darling that I knew I would have to bring it home. I have something else to show you too. It's a tole painted "silent butler". I found this at a thrift shop and just could not resist. Thanks for stopping by our cottage today. Sue always hosts a great Rednesday so please stop by and see her reds too at It's a Very Cherry World. Oh I see, you have replaced your usual teddy bear pals with last year's Easter chick and bunny. Yes I think you did a great job. What's that, you want a treat now? How can I refuse!! We hope that you have enjoyed our decorations. Be sure to visit Marty and the other gals as they display their tabletops. What's that Bentley? Dogs might have their own displays. Okay go visit any dog displays too. What about Cats?? They might have something to show too. Bentley says no cats. On the days that I am working, I like to bring a lunch with me. I want something tasty and nourishing to eat while I am reading a book, such as Laura Child's new book The Teaberry Strangler, or browsing through magazines. By the way, I will be reviewing Laura's new book in a later post. For this first Brown Bag Lunch Recipe, I am sharing my own recipe for Roasted Red Pepper Soup. Chop your onions. Don't worry about chopping them too small, because everything will go in the blender anyway. Add a couple of turns of the olive oil to the bottom of a soup pot over medium heat. Saute the onions until transparent. Add one clove of chopped garlic. Not only is it tasty, but garlic has some great healing benefits like lowering blood pressure during a design crisis! Be careful not to saute the garlic too long because it will become brown and bitter. Add your salt and freshly ground pepper now. A splash of white wine to de-glaze the pan if you choose. Don't worry about the alcohol content, it will cook off. If you don't want to use wine, add a bit of the chicken broth instead. Now add all of the chicken broth and the diced tomatoes. Chop the roasted red peppers. I like to use these flexible chopping mats because you can bend them and easily add the ingredients to your cooking. As I mentioned, I use roasted red pepper in jars quite often, especially at this time of the year. When fresh peppers are plentiful, roast your own. Bring the soup to a boil, then turn down to a simmer and cook for 30 minutes. Let the soup cool a bit. Blend the soup in small batches in a blender. You may add a splash of half and half to smooth out the flavor a bit. Some thin strips of fresh basil are also a nice addition. Put your soup in a thermos or a microwavable dish and enjoy your lunch. I have added some sliced apple and some chunks of cheddar cheese, but you could add a sandwich to round out the meal. Bon Appetit!! This is a portrait of my Grandmother when she was a young girl. My Grandmother had a great sense of humor and loved to tell stories. She told us lots of stories about all the pets she had when she was growing up. She also told us stories about all of the dogs my Dad had when he was young. One of her favorite stories was of the cat she saw in the window of the May Company in downtown Cleveland, Ohio. Every Wednesday afternoon, Grandmother would go to lunch and a movie with her her sister-in-law. They would get all dressed up and wear their hats and gloves and go downtown for the afternoon. One afternoon on their way to one of their favorite restaurants, they were walking by the May Company. This was back when Cleveland was a thriving city and the May Company was one of the big department stores downtown. It was just down the street from where the movie "The Christmas Story" filmed the famous shots of Ralphie looking through the Higbee's Department Store window and later visiting Santa there too. In a display window at the May Company was this china cat. Well, Grandmother instantly fell in love with it and went inside to buy it. The sales clerk carefully wrapped her cat in layers of tissue paper and put it in a box. She then put the box in a large bag with a handle for Grandmother to transport safely home. When Grandmother came home she placed the cat on the hearth by the fireplace and that's where it stayed for years and years. When I was a little girl I never tired of hearing the story of how Grandmother found her cat. Grandmother is gone now. She lived a long and happy life and told us all many great stories. Her cat lives in my cottage now, underneath the portrait of Grandmother as a young girl. I hope that she approves. Thank you for visiting me today and hearing a story about my dear Grandmother. Lot's of other bloggers have their own stories to tell for this Show and Tell Friday at Cindy's Romantic Home. Bet sure to stop by and visit them as well. Before I had a cottage of my own, I started to collect vintage cottage prints. I have always loved these vintage scenes because they are so tranquil and lovely. To me it seems that only happiness could live in these cottages. There could be no place for sadness or worry in these cheerful little homes. Can't you just imagine the lovely fragrance from the flowers, the birds singing, the moonlight shining on the rippling waters. Thank you for visiting our own little Ash Tree Cottage today. Please stop by and visit Suzanne "The Colorado Lady" and all of the other cottages for Vintage Thingy Thursday. Until next time, Bentley and I wish you peace, happiness and joy! I love dogs and horses and they appear in vignettes all over our cottage. The sweet Yorkie in the Victorian frame is my first Yorkie, Bitterman. He was our "little gentleman". When David and I were married, Bitterman stood up with us. It was the first time our Pastor performed a ceremony with a dog standing up with a couple. In the photo peeking out from behind, you can catch a glimpse of my grandmother. She too was a dog lover and loved cats as well. The little fellow in the square frame is my husband David when he was a baby. That's his Dad. Here is a small equestrian theme vignette in a bookcase. The fox in a riding habit is Royal Doulton. There is a small Limoges box next to it. A photo taken while schooling a young horse is in the background. A china horse figurine from my childhood is front and center. Thank you for visiting me today. I am joining Marty over at A Stroll Thru Life for her Table Top Tuesday. Please visit Marty and the other party participants as well. 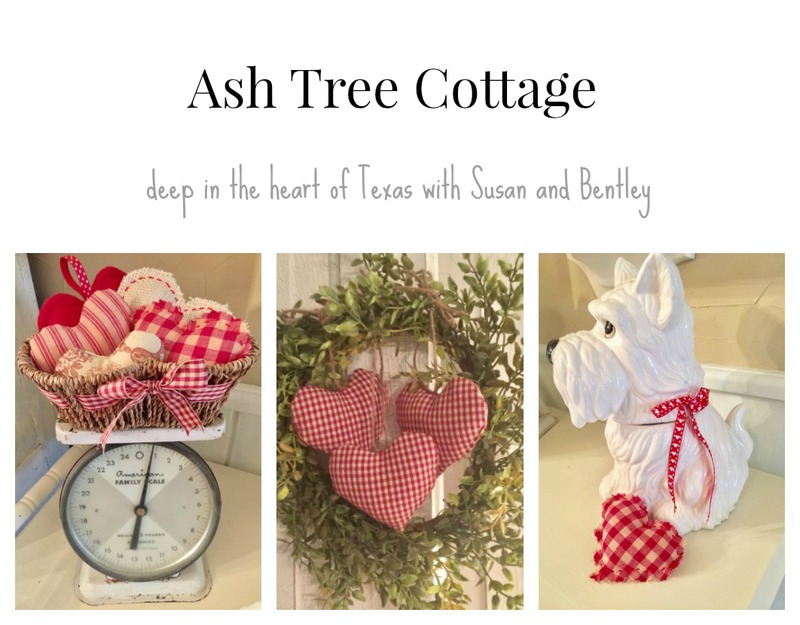 Within the walls of Ash Tree Cottage, there is a little cottage all on it's own. It's a wee cottage, a place for little fairies to live. It's a special place where time stands still. A place that is safe and friendly and free from the cares of the world. Come on in and make yourself comfortable. That's the way, take off you shoes and sit on the sofa or a comfy chair. Just make yourself at home. I'll bring out the tea trolley. Do you take milk and sugar in your tea, or would you prefer to have a slice of lemon? I do apologize, but there is no high definition TV in the Wee Cottage within Ash Tree Cottage. You will have to make do with an old console TV. Oh, and no color either, only black and white. I think it's George Burns and Gracie Allen. A very funny show, I hope you enjoy it. If you need to make a call, we do have a telephone. It's a rotary, we don't have cell phones yet. I hope you don't mind. Of course, if you prefer, we can provide a cozy reading corner among some of the great works of literature. We hope that you enjoyed your visit to the Wee Cottage Within Ash Tree Cottage. We thank Susan and her little dog Bentley for allowing us to show off our place. We are sharing this Wee Cottage for "Show Off Your Cottage Monday" hosted by Cielo at her cottage, The House in the Roses and Brenda too at The Cozy Little House. Please stop by to visit the other participants. We are sure you will have a ripping good time. Susan and Bentley will be back with their own posts later this week. xxoo and Fairy Dust too!! This is a little corner of the solarium I decorated at my Mother's house. It is a very sunny and cheerful spot to sit and have a cup of tea and contemplate what flowers and vegetables to plant in the garden. I am just giving you a glimpse of this room, but will be doing a big post later. Until then, please take some time out to visit Cindy's "Show and Tell Friday" over at her Romantic Home. Spring arrives this weekend! Have a good one! Today I am participating in Suzanne's Vintage Thingie Thursday over at her lovely blog Colorado Lady. While we have many "vintage thingies" in our cottage, this quilt is especially precious to us. Victorian "Crazy Quilts" were very popular back in the late 1800's. Silks and velvets were used and embellished to form a very random pattern. This particular quilt was handed down to my husband from his father, who received it from his own mother. I believe it was originally made for my husband's great grandfather by his sisters. They embellished their patches with initials, flowers, kittens and birds. Look at this sweet little kitten with it's paw in the fish bowl! And the pretty daisies. I think that those are my favorites! We do not display this quit too often. It is still in excellent condition and we are doing our best to preserve it . May 16, 1888 was a long time ago, yet I can sense the dedication and creativity of the young women who lovingly created this quilt. I hope you have enjoyed this precious heirloom. Please be sure to stop by and visit all of the other postings at Suzanne's "Vintage Thingie Thursday"! Vintage Tray From Tired to Fab! I discovered this vintage bed tray at an antique mall that was going out of business. It was such a good price that I could not pass it up. It looked a bit sad though. I decided to give it a few coats of an off white satin finish spray to freshen it up. Now it makes the perfect bed tray for a lazy breakfast in bed. Of course, the vintage bed tray may not be the only thing that could use a metamorphosis ... let's see some wrinkle cream, an eye mask, some anti-wrinkle supplements and a good cardio workout just might do the job!! Now that I am feeling renewed, please join me over at Between Naps on the Porch for Metamorphosis Monday!! Imagine you live in another era when trains took us on long, slow and elegant trips to exotic places. A time when there were porters to load your lovely leather suitcases and trunks into your private compartment. You are beautifully dressed in a ravishing silk dress and wearing a few of your diamonds. You are teetering on your stilettos, the steam of the engine creating a smokey backdrop, while you are a vision carrying a train case covered with tags of various ports of call and hotels around Europe. You have your little dog tucked safely under your arm too. A little dog like Bentley perhaps? When you arrive in your private compartment you open your train case to prepare yourself for an elegant entrance into the lounge for cocktails with a sophisticated gentleman and some friends. You carry all of the "essentials" in your case. Silk lingerie, French perfume, diamonds and pearls of course! What do you say girls, are you ready for an adventure? Then meet me at Cindy's "My Romantic Home" where we will all have fun participating in her weekly "Show and Tell Friday"! It's Rednesday again over at Sue's "It's a Cherry World". Time to show off our reds! I love red and use touches of it in my cottage. I especially like red in my kitchen because it is the punch of color I need to get going in the morning. The red tole tray is a favorite of mine. I found it at a little antique shop several years ago. The red china apple was a party favor from a Christmas party. The red check bowl is part of a set of three cute bowls I purchased at WalMart a couple of years ago. The tea canister is pure kitsch! My Mom told me that they used to sell canister sets like this in dime stores. The red vintage recipe box once belonged to my Mom, and I purchased the other. The salt and pepper shakers are just fun. Thanks for visiting me and be sure to visit Sue and the other party participants! 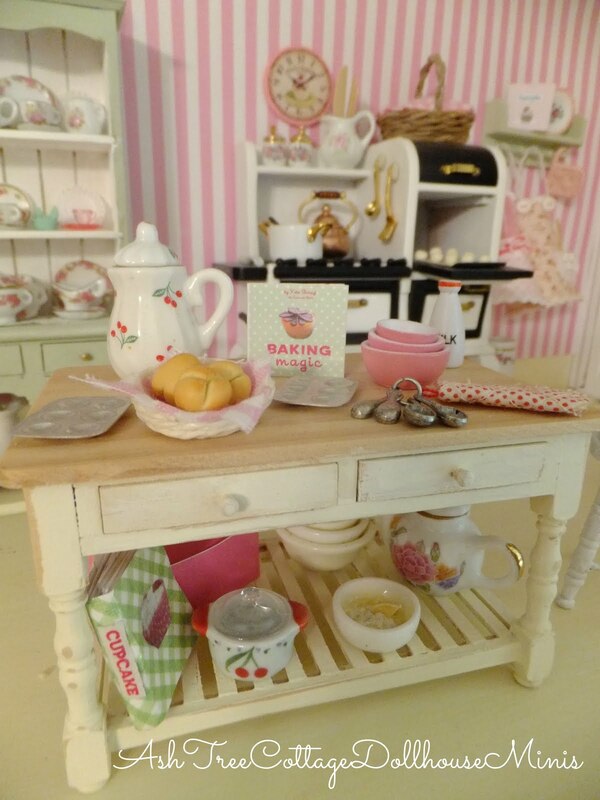 Today I am joining Rhondi over at Rose Colored Glasses for her second Tea Party Tuesday. I love a cup of tea and often have a cup or two each morning. Come join me in a cozy corner of my cottage. I am having a cup of tea and enjoying a good book. I love to read. You may often find me re-reading the classics, or a current notable. Sometimes there is just nothing better than a cozy mystery. I have read a few of Laura Child's mysteries. Her Tea Shop Mysteries are light and fun, perfect reading on a rainy afternoon with a cup of tea. I hope that you enjoyed my little bit of self indulgence. Please stop by Rhondi's beautiful blog and visit all of the Tuesday Tea Party participants. Until next time, Bentley and I will be snuggled up on the sofa. I'll be enjoying my cup of tea and my book, while Bentley will be doing what he does best - cuddling! I was visiting Sue's blog Country Pleasures where I learned that March is National Craft Month. Well I just could not let this opportunity go by without sharing one of my favorite craft projects. Last summer when it was very hot outside and not very pleasant for gardening, I decided to use up some scraps of fabric from an old quilting project to make a new bed skirt and pillow and quilt for an old doll bed. I am also participating in Make it Monday over at Cindy's Cottage Instincts blog. Please stop by and visit all of the other crafters at her party today. I had some left over chenille from another project and used it to make a duvet too. I hope that you enjoy this project I am sharing with you as much as I did creating it! Get out your glue guns, fabric, paints and brushes, or whatever medium you use and enjoy this month to get creative! Don't forget to visit Cindy's blog.